FILE - Australian Minister of Immigration and Border Protection Peter Dutton inspects guards of honor during a ceremony for the arrival of the first Malaysia Maritime Enforcement Agency bay class vessel in Port Klang, outside Kuala Lumpur, Malaysia, Feb. 27, 2015. The Australian immigration minister on Wednesday made a blunt videotaped pitch to asylum seekers detained on the Pacific island of Nauru to accept a resettlement offer while stressing they should forget about ever moving to Australia. “I want to make it very clear to all refugees and transferees in Nauru that you will not, under any circumstances, be settling in Australia. This is not an option that the Australian government will ever present to you,” said Peter Dutton, the immigration minister in the video message. Cambodia has agreed to take more than 1,000 refugees in exchange for what is described as a $30 million aid package from Australia. 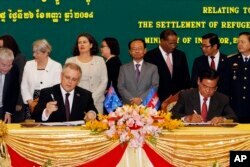 FILE - Australian Immigration Minister Scott Morrison and Cambodian Interior Minister Sar Kheng during a signing ceremony of a deal on resettlement of refugees, at the Interior Ministry in Phnom Penh, Cambodia, Sept. 26, 2014. The agreement has been criticized by numerous rights workers who contend it contravenes the United Nations Refugee Convention. The immigration minister touts Cambodia as offering the refugees a “wealth of opportunities,” describing the impoverished Southeast Asian nation as fast-paced, vibrant and diverse. In reality, Khmers compose 90 percent of the population of 15.5 million people, while half of the remaining ten percent of those living in Cambodia are ethnically Vietnamese. Ninety-seven percent of the people in Cambodia are Buddhist. More than 700 asylum seekers held in Nauru are from Africa, the Middle East and South Asia. Nearly 500 have been deemed to be genuine refugees, more than 80 have had their claims rejected and another 150 have yet to be assessed. It had been anticipated that the first refugees would move to Cambodia by the end of last year, but they have been reluctant. A refugee advocate on Monday said five asylum seekers - described as three ethnic Tamils from Sri Lanka, a Rohingya Muslim from Myanmar (also known as Burma) and an Iranian — have agreed to be among the first to accept the Cambodian offer. Tension has been high in the Australian-run detention center where there has been sporadic rioting. A fire during a violent protest in 2013 destroyed all the accommodation blocks, medical facilities and offices. The Refugee Action Coalition, an Australian-based rights group, says asylum seekers are being offered between $7,800 and $11,700 to go to Cambodia. Nearly two dozen current and former medical staff, teachers, social workers and other employees of the detention center have signed an open letter calling for all of the asylum seekers to be permitted to go to Australia to protect them amid widespread physical and sexual abuse. Australia has significantly toughened its asylum policies in recent years. It now tries to return boats to the point of origin if they are carrying people not authorized to enter the country or sends them to the remote detention camps on Nauru or Papua New Guinea. “Stopping the boats” was a centerpiece of Prime Minister Tony Abbott's 2013 successful election campaign. But Australia's stance has come under renewed scrutiny in recent weeks, by both supporters and opponents of hardline policies on maritime migration, in wake of the surge of deaths by those seeking to cross the Mediterranean from Africa to Europe. Australia appears to be having no change of heart, however. Australian immigration officials last week evaluated and rejected the asylum claims of 46 Vietnamese aboard an Australia navy vessel before all were sent back to Vietnam, according to Fairfax Media. “The reports are extremely concerning and represent a fundamental violation of refugee rights by the Australian government,” said Amnesty International refugee campaign coordinate Graeme McGregor. Prime Minister Abbott, for his part, believes European countries should follow Australia's lead.